Hey Bloggers from the Northern Hemisphere. You are frolicking in the sun and cloud-gazing on the grass with naked feet and I'M STUDYING MAPS AND MEMORIZING LATITUDES AND READINGRESEARCHINGREALLYNERVOUS. Like "okay, I just got diarrhea." That's how nervous I am. But, alas, Winter Holidays are not that far away. They're close enough for me to get distracted from the maps and the textbooks. I'm already day dreaming. I already have a to-do list. You know, the kind you do when you should totally be studying. Watch a lot of Youtube from my favorite vloggers. Read a lot. I've got a book on Kabbalah, Doctor Zhivago, poems and short stories a-waiting for me. Interview my almost 100 year old grandma for the Roots project. Get back in shape. Really. Write a lot. I haven't written seriously for a while. That's it for today. Were a future editor to read this post, I would never, ever get published. The only excuse I can use for my lack of grammar and of vocabulary diversity is hysterics. I'm a hysterical person, man. Who do editors think they are anyways? Well, I'm from the Northern Hemisphere but I have university exams until mid July so... I consider myself out of your hatred! Have you winter nd not summer?! Here (Germany) are 36°Celsius!!! 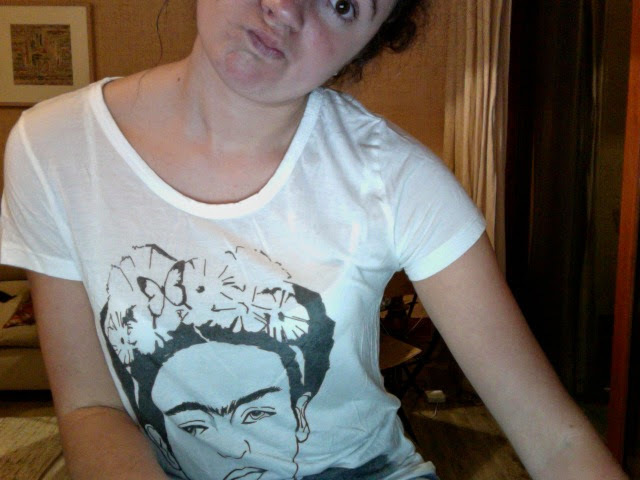 ahhhh i love your frida shirt!! so jealous!!! !